The German energy audit program for firms—a cost-effective way to improve energy efficiency? In 2008, a program was established in Germany to provide grants for energy audits in small- and medium-sized enterprises. It aims to overcome barriers to energy efficiency, like the lack of information or a lack of capacity, and is intended to increase the adoption of energy efficiency measures. We evaluate the program's impact in terms of energy savings, CO2 mitigation, and cost-effectiveness. We find that firms adopt 1.7–2.9 energy efficiency measures, which they would not have adopted without the program. Taking a firm's perspective, the program shows a net present value ranging from −0.4 to 6 €/MWh saved, which very likely implies a net benefit. For the government, each ton of CO2 mitigated costs between 1.8 and 4.1 €. Each euro of public expenditure on audit grants led to 17–33 € of private investment. The cost-effectiveness of the program for firms and the low share of public expenditure underline its value for the German energy efficiency policy mix and suggest that it should be expanded in Germany. Further, the good experiences with the program in Germany should encourage countries which have not yet established an audit program to do so. We would like to thank our colleagues for intensive discussions and their valuable input. We are particularly thankful to Birgit-Jo Frahm, Joachim Schleich, Patrick Plötz, Christian Stenqvist, Christine Mahler-Johnstone and Vicki Duscha as well as two anonymous reviewers. Part of the work was conducted within the framework of a project for the German Federal Ministry of Economics and Technology. Photovoltaic plants, stand-by losses, demand-side management to shift demand peaks, others. Cahill, C., & Ó Gallachóir, B. (2011). Quantifying the savings of an industry energy efficiency programme. Energy Efficiency. doi: 10.1007/s12053-011-9132-8. Stenqvist, C., & Nilsson, L. (2011). 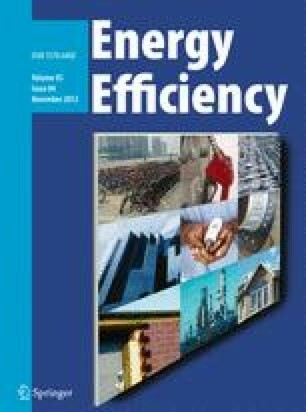 Energy efficiency in energy-intensive industries—an evaluation of the Swedish voluntary agreement PFE. Energy Efficiency. doi: 10.1007/s12053-011-9131-9. Thomas, S., Boonekamp, P., Vreuls, H., Broc, J. Sb., Bosseboeuf, D., Lapillonne, B., & Labanca, N. (2011). How to measure the overall energy savings linked to policies and energy services at the national level? Energy Efficiency. doi: 10.1007/s12053-011-9122-x.